Your office should be comfortable and professional. The furnishings you choose for this private space should be chosen with care. Amish furniture is known for its quality design, straight edges, and classic appeal, making this type of furniture ideal for the office. Consider the following reasons to incorporate Amish pieces in your office, whether you work in a business setting or have a private work space in your home. Amish furniture is designed by hand with expert craftsmanship. For the office, you need pieces — such as desks, bookshelves, and chairs — that express a professional, clean appeal. Since Amish pieces are crafted with fine detail and attention to durable construction, you exude confidence in your decorative choices when you select this type of furniture for your office setting. No two pieces of Amish furnishings are alike and the designs you’ll find with this type of furniture stray from the contemporary and mass-produced items you’ll find in traditional furniture stores. Since your office is largely an expression of who you are and what you represent, you want to select furnishings that will put you in the best light. Customize your Amish furniture selections by purchasing various styles of wooden pieces. For example, your office desk can be comprised of walnut, which is rich and finely grained, while a coffee table or end table piece can be chosen in an elegant cherry. The deep red hue will draw the eye and give your office a positive focal point. Since Amish furnishings are built to last, you save money on your investment by not having to worry about repairing or replacing your furniture for many years once purchased. For this reason, make sure you do your research and compare many Amish designs to one another so you select the office pieces that you’ll enjoy most. 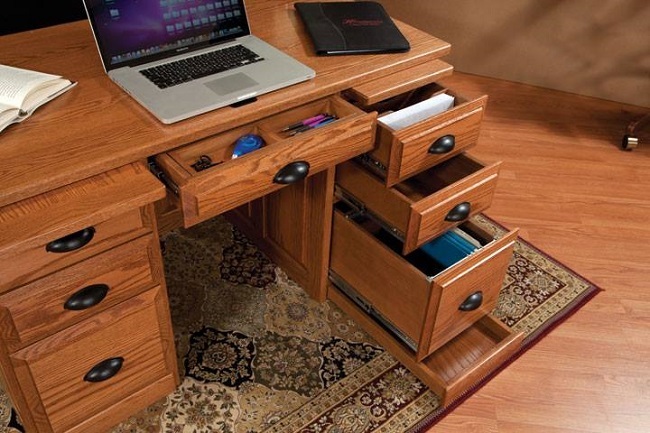 Amish furniture brings class and value to your office space. See our showroom at Amish Furniture Showcase, serving Dallas residents and more; contact us today for all your office furniture needs.